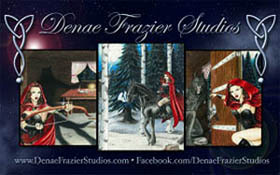 « Denae Frazier Studios is excited to announce that Star Wars Masterwork has been released! Good afternoon everyone, here’s 2 more Original art pieces Denae did this week. Enjoy! Ariel – This Original art piece is 6.75″x10.5″. Done in Ink, Colored Pencil and Copic Marker. Jessica Rabbit – This Original art piece is 6.75″x10.5″. Done in Ink and Colored Pencil. Also, This Friday-Sunday (Feb. 13-15th) we’ll be at Amazing Arizona Comic Con at the Phoenix Convention Center! This entry was posted in appearances, art, events, news and tagged Amazing Arizona Comic Con, Ariel, Colored Pencil, Copic Marker, disney, Jessica Rabbit, Original Art, Phoenix Convention Center, The Little Mermaid, Traditional Art, Who Framed Roger Rabbit. Bookmark the permalink. Trackbacks are closed, but you can post a comment.